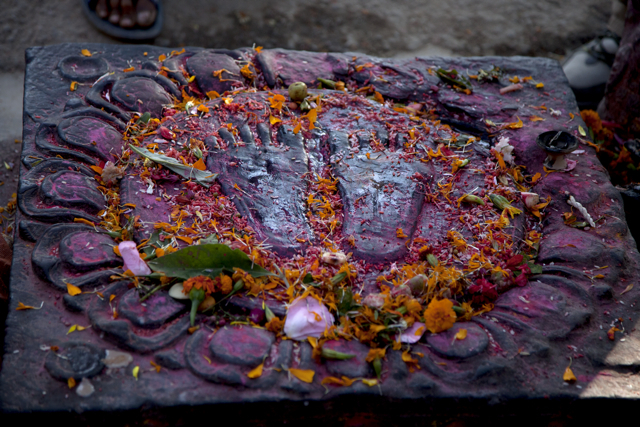 YOGA & BUDDHISM RETREAT — YOGANEPAL.com - Join Our 10-Day Yoga Retreat & Life-Changing Pilgrimage in Nepal! Join YOGA NEPAL in Kathmandu for 10 days of Mysore style yoga practice, teachings in Buddhist philosophy and meditation, cultural tours, hikes in the Himalayan foothills, delicious food, and the company of good friends. With the help of expert guides and educators, we cover many of the valley's major pilgrimage and cultural heritage sites in depth (with lots of special surprises along the way :). For more information on CORY, guest speakers and staff, please visit his teacher bio page. Scroll down for COST DETAILS and deadlines at the bottom of this page. You'll spend the first half of the pilgrimage in Boudhanath – a massive, three-dimensional mandala (one of the largest Buddhist shrines in Asia) and a UNESCO World Heritage Site surrounded by more than fifty active monasteries! Hundreds of Tibetan and Nepali devotees circumambulate the stupa while reciting mantra and spinning prayer wheels every morning and evening. Here, your teacher Cory Bryant will lead morning yoga classes from a shala that overlooks the stupa. Engulfed in the morning rituals of incense, butter lamps, mantra, prostrations, pujas, and walking meditation, you’ll practice yoga and receive dharma teachings as monastic life carries on around you. This incredibly sacred environment will become our home. You’ll spend the first six days of the program taking in the best that Kathmandu has to offer with its extraordinary temples and shrines dedicated to Hindu, Buddhist and local deities. Day 1: When you touch ground in Nepal, our drivers will be there to greet you and provide transport to Boudhanath and the Siddhi Manakamana hotel. Once there you can unwind from your journey, rest, enjoy the garden and a meal, and soak up the atmosphere. Throughout the afternoon, Cory will be available for one-on-one meetings to check in and develop a strategy for your practice. In the late afternoon, the full group will come together for orientation followed by a tour of the stupa. We’ll have our welcome dinner at a rooftop restaurant with spectacular views overlooking the stupa before turning in for the night. Day 2: The first morning will start with an early mindful group walk down to the stupa and into a monastery to observe the Buddhist monks doing puja (ritual ceremony). From there we’ll proceed together to the yoga shala for a led practice followed by pranayama, chanting and a dharma talk. Buddhism and yoga share common roots and each day Cory and James will support your personal journey through the integration of these shared principles, helping you develop your sadhana (practice). After breakfast at the hotel, James will lead us on a back road tour of the village ending at one of the largest monasteries – Shechen – where we’ll have a healthy lunch in their garden café (where you can safely eat a green garden salad!). Following lunch you’ll have free time to wander through a few of the monasteries in the area and check out the countless shops selling Buddha statues and other ritual items as well as textiles and other local handicrafts. You can also simply relax wherever you’d like and take in the sights and sounds of life in Boudha. Later we’ll regroup for our first trip to Kya Nying Shedrup Ling Monastery (commonly referred to as the “White Gompa”). This is a special place for Yoga Nepal as it’s where our founder, Marni Kravitz and our co-host, James Hopkins, have devoted years of study and as such we have developed a special Yoga Nepal relationship with the monks and Western scholars who live, practice and study there. On this first night we’ll receive a teaching entitled "Introduction to Buddhism" from the head of the Western program at the shedra. After the talk, we’ll head to dinner to reflect on the day. Day 3: Starting on this day and through the remainder of the trip each morning will begin with 6 am guided meditation, followed by Mysore style yoga practice, and pranayama, chanting and dharma talk. After practice we’ll head back to the hotel for breakfast and head out on the day’s adventure. It’s a trip to another famous stupa – Swayambhunath. We’ll climb 365 steps to reach this powerful pilgrimage site. The epic climb is an auspicious way to cap off the beginning of your journey! Also known as the ‘Monkey Temple’ due to the abundance of Rhesus Macaques that live here, Swayambhu offers a fanastic view of the Kathmandu Valley. Here, we’ll learn how stupa architecture reflects Buddhist thought, meet the ‘5 Dhyani Buddhas’, and join local pilgrims as they circumambulate the holy site. Day 5: An easy day… you’ll have free time following morning practice, and then we’ll regroup in the late afternoon to make our way to the White Gompa. Here we'll receive our first teaching with Khenpo Tokpa Tulku – Cory’s teacher – and an incredibly gifted monk with the ability to offer his enlightening and accessible teachings in English. You’ll have the special opportunity to greet him and offer the traditional 'katag' or ceremonial scarf, which he will bless and return to you by draping it around your neck. Afterwards we’ll have a group dinner – brick oven pizza and salads! Day 4: Put on your hiking shoes! After our early morning practice and breakfast, you'll venture outside the city to Nagi Gompa, a Tibetan Buddhist nunnery tucked away high on a hilltop in Shivapuri National Park. See first-hand how the nuns live, experience a genuine place of retreat, and enjoy sweeping views of the valley. From here, you'll head out on foot down the steep hillside past local villages and through pine forests to Pullahari, one of the most stunning Tibetan monasteries in the Kathmandu Valley (a 2.5 hour hike). Visit with the young monks, observe their evening puja and witness an incredible Kathmandu sunset. Tonight you'll enjoy a delicious meal back in Boudha after a long day's trek. 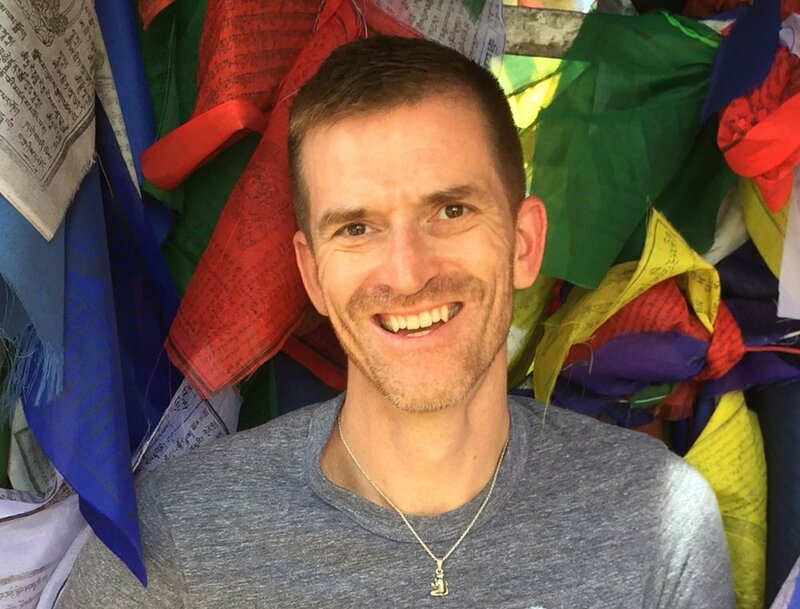 Day 6: After early morning practice and breakfast, James will take the group to an Indian encampment where you’ll have the opportunity to meet the amazing women behind the nonprofit Quilts for Kids Nepal. Then it’s lunch and free time before returning to the White Gompa and our second session with Tokpa Tulku. After the teaching you’re on your own for this, our last night in Boudha before heading out and up into the Himalayan foothills! Just when you're ready to take up the monastic life, you'll head to the valley's edge, to the hills of Kavre. The peacefulness of this stretch of the valley is hard to imagine until you're there. At Namo Buddha Resort, you'll enjoy 3 days of Himalayan views and lush, green terraced fields. It is the ideal place for practice, and the surrounding hills and villages provide beautiful scenery for day hikes. Day 7: It’s a rest day – no asana practice! After breakfast you'll head to Namo Buddha, long held as a "power place" for spiritual practice and retreat. You'll arrive at the Namo Buddha Resort in the late morning in time to check out the lush grounds of this “Hobbit-like" retreat before lunch. After lunch you’ll have time to settle into your cottage and soak up the scenery. Before dinner we’ll gather in the yoga shala for a dharma talk and meditation. Day 8: At the lodge, enjoy early morning yoga followed by a bountiful breakfast overlooking the snow peaks of the Himalayas. Then we’ll hike to nearby Thrangu Tashi Choling Monastery, perched on a steep ridge overlooking the valley. Here, the view is so spectacular you just might think you've already reached nirvana. The beautiful and sprawling Thrangu Monastery was built on the hillside where, in a previous life, the Buddha is said to have offered his own body to a starving tigress in order that she could feed her cubs. The site celebrates this fearless act of compassion and is a principal pilgrimage place for Tibetan Buddhists. We’ll return to the lodge for lunch followed by free time and a late afternoon yoga workshop before dinner. Day 9: After an early morning practice and breakfast at the resort, you'll take a 3-hour hike through local villages and rice terraces to see and experience life among the Himalayan hill communities. Back at the lodge, enjoy free time before a late afternoon yoga workshop followed by another delicious and healthy meal in this special place. Day 10: After morning practice you'll head back to where you started -- Boudhanath. For many, it's the last full day in Nepal, so after checking back in, you'll have the opportunity to spend time as you’d like here within the heart of Tibetan Buddhism. This evening we’ll celebrate our experience and the bonds of friendship with a special dinner made just for us by a wonderful Tibetan chef in the comfort of her stylish gallery and private dining space. Day 11: After our final morning practice, we'll have breakfast and some final goodbyes. It's time to head back home. Your airport transfer will be waiting just outside of the hotel. During your 6 nights at the Siddhi Manakamana Hotel, you’ll rise to the sound of monastery horns and enjoy early morning practice as monastic life carries on around you. Siddhi Manakamana, located just steps from the Boudhanath Stupa, offers simple, comfortable rooms, each with its own bathroom and hot water, flat screen TV, and balcony opening out to a pleasant garden. Here you can breathe and relax while you take in the many sights and experiences that Boudhanath can offer. No doubt you'll be joining the locals for morning and evening kora, circumambulation of the stupa. Internet access is available here as well as many other sites around the Boudhanath Stupa. You'll spend 3 nights in the Himalayan foothills at Namo Buddha Resort. Located at the top of an 1,800 meter (5,905 ft) hill, the resort offers a taste of the simple life in the Nepali countryside. Comprised of several small, beautifully built cottages, this one-of-a-kind resort is rich in traditional Nepali style. All cottages feature, adobe walls, decorative niches, stone roofs, colorful textiles and lots of gorgeous woodwork. On a clear morning, wake up to panoramic views of the Himalaya, including the Annapurna and Khumbu mountain ranges. The resort is surrounded by forest and has its own organic farm where vegetables, grains, flowers and many fruits are grown. They collect milk from their own cows and honey from their bees. They also makes their own jams, breads, and other bakery items. Back in Kathmandu, the Hyatt Regency will be your home for the last night of your journey. Enjoy sweeping stupa views from the main lobby. Rooms are spacious and tastefully decorated with high quality linens and luxurious bathrooms. The hotel spa offers a swimming pool, massage services, steam, and sauna. Pamper yourself in preparation for the journey home. We always seek accommodation that strikes the balance between modern comfort and local flavor. A non-refundable deposit of $750 is due upon registration. All balances are due no later than August 1, 2018. Please note that all program fees are non-refundable after August 1, 2018. Costs include accommodation and most meals plus tea and water at meal times, excursions, teachings, guide fees, entrance fees, airport transfers and ground transportation in Nepal. Costs do not include airfare or travel insurance (recommended).